**** AT OUR SEVIERVILLE LOCATION **** The Escalade has led the way in the re-emergence of Cadillac as a world-class luxury brand. Its sharp, chiseled styling makes a strong statement and the bold looks are backed by lots of power and GM's latest technology. The Escalade nameplate includes three dramatically different though distinctly similar models: The standard Escalade is a full-size SUV, the same size as the Tahoe. The Escalade ESV is a Suburban-sized model. The Escalade EXT is Cadillac's interpretation of the Avalanche, a brilliantly executed sport-utility truck that can quickly be converted from pickup truck to luxury SUV through the use of GM's innovative mid-gate. All three feature a high-performance 6.0-liter V8 and all-wheel drive. Built on GM's excellent full-size truck platform, the Escalade, ESV, and EXT are fine trucks and make excellent tow vehicles. On the road they are smooth and stable, a bit softer in ride than a Tahoe or Suburban. They are luxuriously appointed, providing comfortable accommodations while offering the capabilities of full-size truck. The Escalade was introduced as an all-new model for 2002. The EXT joined the line, followed by the ESV. They share interiors, refreshed for the 2003 model year. More features have been added for 2004 including a new tire pressure monitoring system. 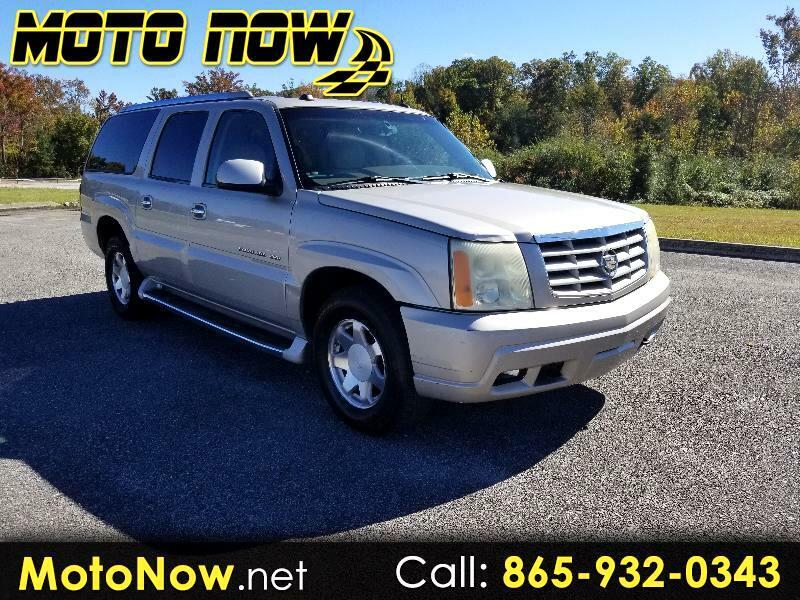 The standard two-wheel-drive Escalade is powered by a 5.3-liter V8 ($51,055), but is available with all-wheel drive and the high-output 6.0-liter V8 engine ($53,955). Escalade ESV ($56,380) and Escalade EXT ($51,230) come standard with the 6.0-liter V8 and all-wheel drive. Though the Escalade, ESV, and EXT differ in appearance, they share interiors and are mechanically the same. Cadillac is usually the first to get GM's cutting edge technology and all the Escalade models come loaded with the latest: StabiliTrak electronic stability control, computer-controlled road-sensing suspension (RSS), Ultrasonic Rear Parking Assist (a warning beeper). The list of standard equipment is as long as the Escalade itself: Nuance leather seats with Zebrano wood interior trim; power heated 10-way adjustable front seats; Bose Acoustimass audio system with six-disc CD; rear seat audio controls with earphones; removable lightweight third-row seats; Heavy Duty Trailering Package. Also standard is the OnStar communications system with Personal Calling, which allows drivers to make hands-free, voice-activated personal calls, and Virtual Advisor, which provides headlines, scores, weather, and personalized stock quotes. For 2003, a DVD rear seat entertainment system and a DVD navigation system were added as standard equipment. For 2004, XM Satellite Radio comes standard. Second-row bucket seats are standard (and a second-row bench is a no-cost option). The list of options is short and includes special paint ($995) and a power glass sunroof ($1550).